I’ve recently added a D3100 to sit alongside my D70 in my camera bag. 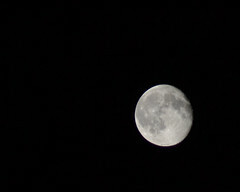 Heres a shot I took a few days ago of one of my favourite subjects, the Moon. Click for the bigger (1024 x 768) version.